The official Apex Legends Twitter account has announced that the game has hit 50 million players worldwide. Moreover, the feat was achieved in a single month. This free-to-play game was released onto an unprepared public on 4th February and is available for PC, Xbox One and PlayStation 4. Game market intelligence expert Daniel Ahmad of NikoPartners, addressed the elephant in the room - How well is Apex Legends doing in comparison with Fortnite Battle Royale? The answer can be seen in the bullet points he shares but the key stat is that while Apex Legends has reached 50 million players in 4 weeks, it took Fortnite more than 16 weeks to reach this milestone. Roundhill Investments put together a chart comparing the two games' ascent. According to this chart Fortnite reached 50 million players in 17 or 18 weeks. 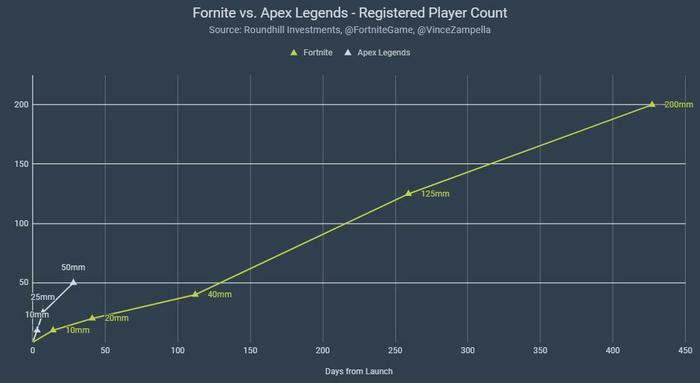 Nevertheless, there is still a long way to go until Apex Legends will near Fortnite's colossal 200 million players. In terms of Twitch views, Apex Legends has already got really close to Fortnite as you can see in TwitchTracker. In some ways Apex Legends cleverly benefitted from Fortnite's success. Fortnite spent some time in the f2p wilderness, relatively speaking, before it implemented its Battle Royale mode - but on the other hand that gave it an immediate audience. However there is now a ready-made audience of gamers who are 'Battle Royale fans' who leapt onto this free offering from heavy hitters EA and Respawn. After pleasing first impressions, the game has gone viral among this audience and their friends. 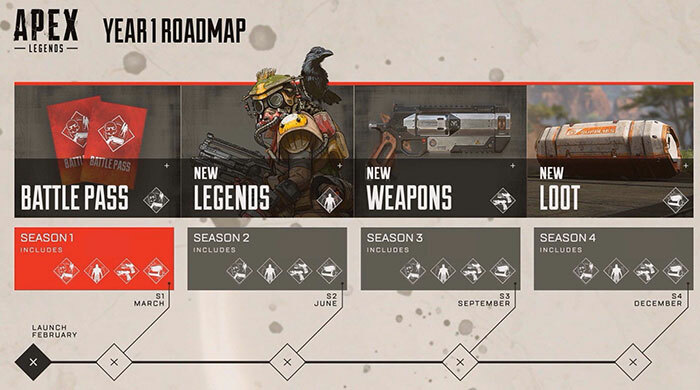 A Battle Pass for Apex Legends will arrive sometime this month. Introducing this pass will be a major opportunity for EA to monetise Apex Legends and it will hopefully strike the right balance and offer good value so it is well received. Season One, starting this month, will see the introduction of new Legends, weapons, loot, and more. With Fortnite and PUBG season passes costing about US$10, there is no reason to think EA's pricing strategy will differ. Official hints and data miners seem to indicate that there will be both a 'free' and 'diamond' battle pass. Any items in the battle pass should also be unlockable through gameplay. Apex Legends for PC is available for download via Origin. I finally decided to give this a shot this weekend. My intial impressions after 2 hours were that it's kind of fun, but it's not going to take me away from PUBG and it really doesn't have the same addictive quality for me. It's a bit like a cross between Fortnite and COD Blackout - very arcadey in style and a bit of fun, but I am dubious about it's long term lifespan. I think it's gathered a lot of interest very quickly, but the long term player count remains to be seen. Much more fun than fortnite - the first person perspective makes a huge difference, and not having a building mechinic is a huge plus. The player cap is a furstration that needs to be addressed - in most games you either hot-drop and have instant fights, or drop to loot and spend 20 min doing nothing before finally seeing another player. 60 players is at least 40 too short. It's not really a battle royale game on account of it being completely unbalanced. They can't change this without removing the hero mechinic mind. On the twitch side I think it's better to watch live than Fortnite, even for highlights on youtube the clips are much easier to digest without the building aspect. For someone who watches a lot more games than actually plays them like me, I think AL is a step in the right direction. You dont know anyone playing it? i dont know anyone that is not playing it!! !